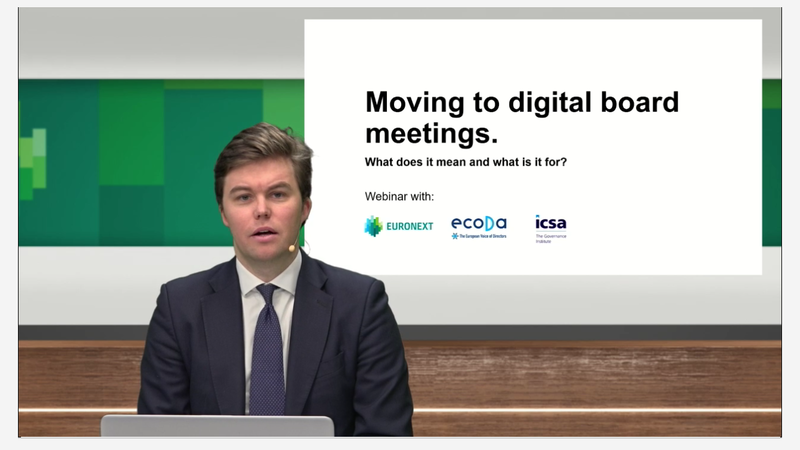 That's why a panel of experts from Euronext, ecoDa and ICSA came together for a live discussion about the perks to going digital, what you need to know about security, how to make it a seamless transition for your board and more. Below we have outlined the key takeaways from the discussion, although if you would prefer to watch the recording – you can find the full discussion here. 1. What strategic objectives should a board aim to achieve when moving to digital? 2. How serious if the security threat and how can boards secure their strategic information flows? 3. What advice do you have for a successful transition of a board to a board portal? 4. How can a board evolve from mere data processing to actual value creation? Portals are about efficiencies for secretaries and convenience for directors. Lead by example and set the tone from the top. Moving from paper to portals should be a collective decision and you should secure the support of the CEO and the Chairman upfront. Digitalisation is also about better structuring your governance and decision-making. Portals help you build a corporate memory for your organisation, making information more readily and easily available over time. Helping the board not to lose momentum while onboarding new members (and not losing the expertise of past ones), which is always a challenge. Paper and emails are the real security treats, not hackers. It’s all about traceability and keeping the decision-making process in a closed environment end-to-end. It’s important to know where your data is being stored and who has access to it – make sure you know that about your board portal provider. From a governance perspective, it’s important to have an audit trail and be able to search into the history of decisions and actions, and a portal gives you that with no extra effort. Board packs tend to focus on the past, but meetings should be focused on strategic, forward-looking challenges and issues. Portals are a great tool to help you do that more effectively. This is about creating the decisions for better governance and decision-making. For instance, creating a reference reading sections aside from board packs to help board members come more prepared for ambitious and creative discussions. Don’t take advantage of the switch to digital to overwhelm the board with too much information. It can be tempting to make board packs longer once you’re not seeing the heavy stacks printed out, but they still need to be functional and focused on critical information. Want to watch the full webinar? You can find the recording here.